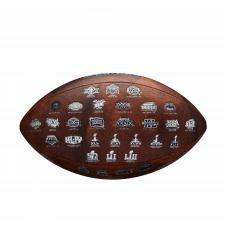 Super Bowl 53 (LIII) Commemorative Football with all 53 Super Bowl Logos | Sports Memorabilia! Made by Wilson Sporting Goods, this is a great Super Bowl 53 Commemorative football that has all 53 Super Bowl logos imprinted on the football. The Super Bowl LIII logo is very large and displayed on the main football panel along with the date 02-03-19. All the other 52 Super Bowl logos are displayed on the other panels on this full size Super Bowl 53 Commemorative Football. The production of this football is complete so there is a very limited supply available.